To explore our Summer Bubion Road Cycling Holidays please click here. The best road cycling in the heart of MTB. Switchbacks has been operating for almost 20 years offering MTB holidays based in Malaga and Bubion, Sierra Nevada National Park. With our love for all things cycling and knowledge of the infrastructure of 100kms of perfect roads in the area, we now offer Switchbacks Road Cycling Holidays to match our classic Enduro MTB holidays. An undiscovered road cycling paradise. Imagine 100kms of roads perfect for a winter holiday or training. Imagine little to no traffic. Imagine warm sun, cooling breezes and altitudes of between 300 and 1500ms for great training. Imagine Switchbacks Malaga Winter Road Holidays. Check out an example ride by clicking here. The roads of the province of Malaga offer a road cyclist 100kms of perfect and lightly trafficked roads. Based in Alhaurin el Grande we offer week long and long weekend (4 night) road riding holidays for the cyclist looking to ride the road less travelled. We provide 10 different rides ranging from 100km killers with around 1500ms of climbing taking you to stunning sea views and hidden corners of the Costa del Sol, to 30, 55 kms loops and 500-800ms climbing. Our routes have been tried and tested taking in important logistics such as the best coffee bars and lunch stops all pinpointed on the supplied GPS route notes. Our 9 seater vans are on hand with spares and tools in case of any problems. The best thing about non-guided rides is that you the rider can hit the climbs at your own pace without fear of having to keep pace with the rest of the group. This no pressure riding leaves one to stop and enjoy the ride as you wish. Malaga offers an incredible variety of routes and geographies. From the tranquil environs of EL Chorro – Spain’s Lake District to Montes de Malaga which start and finish in the centre of fantastic Malaga capital with its lively tapas bars and beautiful sandy beaches. 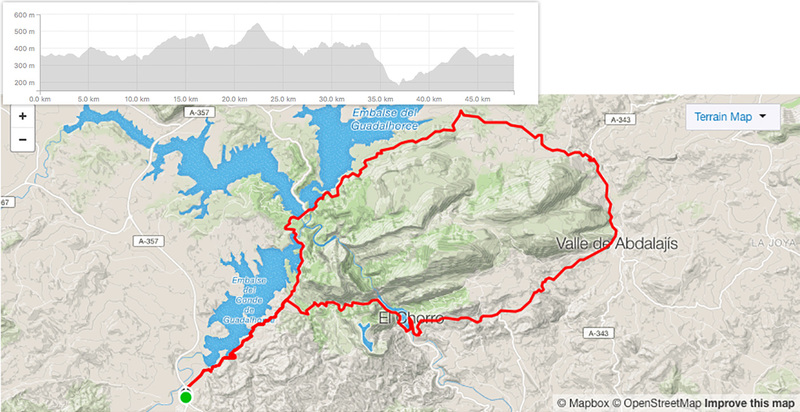 Later ride stage 1 of the 2015 Vuelta de Espana from Marbella through Sierra de las Nieves National Park and beyond – road cycling paradise. Malaga is also the winter training home for professional cycling teams such as BMC, Specialized and Sky. We enjoy an 85% customers return rate – come and see what you are missing!